​​​​ AUSTIN – Ground has broken on phase one of the Texas Facilities Commission’s North Austin Complex at the intersection of 51st St. and North Lamar Blvd. 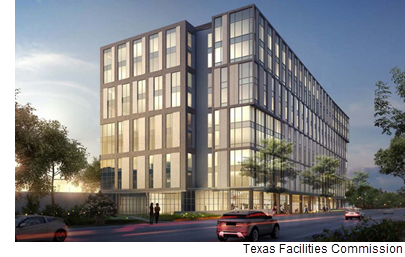 The project consists of two structures—a nine-story, 406,000-sf, Class A office building and a multilevel, 1,850-space parking garage—and is projected to save the state $8 million a year in lease-cost avoidance. The facilities are expected to deliver by summer 2021. A planned second phase, which would include an additional 302,000 sf of office space and 2,000 parking spaces, has yet to be funded. ​See also: State-owned John H. Winters Building to undergo major expansion (Community Impact).